Even when the hour is titled "All About Her," I still can't find my way back to enjoying time with Chloe. 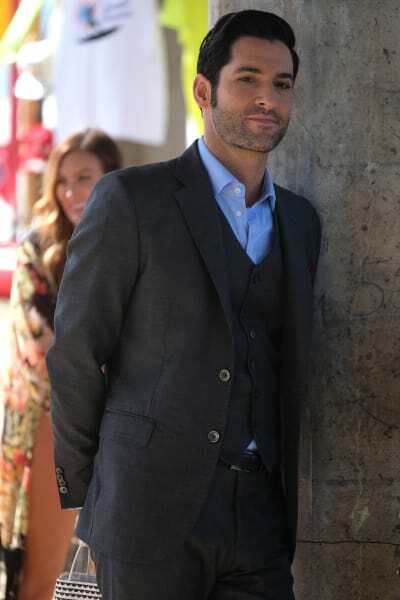 While the Devil selfishly wasted his time during Lucifer Season 3 Episode 12 trying to make it "Detective Day" all in his attempt to appeal to Chloe's good graces so she'd reciprocate his behavior, every other character but Chloe had interesting material. Even Charlotte, who was barely featured had an endearing scene with Ella. Whatever staff in the writers' room stands behind Chloe Decker, they need to step up to the plate. 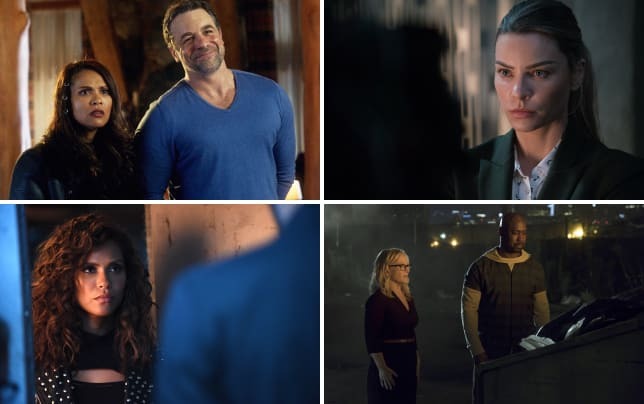 Honestly, I'm also a bit ticked to discover there wasn't a single publicity photo featuring Ella, Charlotte, Dan, Maze, Linda, or Amenadiel when they had the stories that made a difference to the future of Lucifer, beside Lucifer and Cain/Pierce, of course. 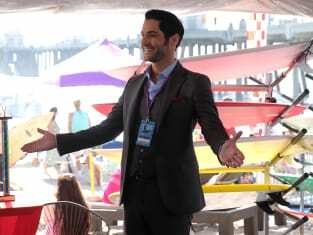 There are a plethora of photos of Chloe and Lucifer at the beach (boring) and one of Cain. Bless you, Cain, but I don't want to call you Pierce anymore even if that's the moniker you prefer. It's my review. You're forever Cain to me, buddy. Starting out slowly, let's dig into Maze, Linda, and Amenadiel. It's startling how naive Amenadiel remains after his prolonged time on earth. He's still so easily fooled and willing to believe anything. Angels don't get human diseases, but he was willing to roll with Chlamydia as his first, before sniffles or a scratchy throat. It was an entertaining way to dump Linda and Maze into the same box, though, wasn't it? Maze has been continually working on her people skills and giving Linda a knife that will cut through bone like butter would be incredibly handy when eating a good steak. Not so handy for a novice to have around when the demon wanders in on the good doctor and her angel making love, though. Am I the only person who periodically forgets Maze lives with Chloe and Trixie? I never forget how much Maze and Trixie get along, but that they live together is outside my realm of thinking because Maze is so frank. How can Chloe be a good detective and allow Maze, talking about her inhumanity, alone with her daughter? If she refuses to believe Maze is anything but quirky, she should at least reconsider when the woman is wantonly tossing knives across the room. The calls for Amenadiel's STD arrived with great timing. First causing Linda to do a spit take at her friend with whom she's a lot closer than they both realize, and then when Maze was watching the new couple celebrating their love and clean bill of health. Will Linda's actions set Maze over the edge? That could affect everyone, but it would be a more realistic story than her learning to lean into it and forgive easily. There was other miscommunication between quasi-couples, as well, when Lucifer went to Dan for advice on turning Chloe's head. It's still bothersome so many people disregard Dan when he works as hard as he does. Why would anyone think Chloe the automatic best choice for a case over Dan? Dan has more experience, and there's nothing wrong with playing things by the book rather than going with your "gut," which doesn't exist in criminal law. We deserved to have a photo of Dan taking on the surfer gang. He's in great shape, he can surf, and when he lost communication with his backup, he didn't make the best out of a bad situation but got information that led to the case being solved. He should have been invited to champagne on the beach. Ella's behavioral change was so sweet and so perfectly Ella. Initially, I thought she was upset at someone other than Pierce because it was so unlike her. Yet only Charlotte, her budding bestie, called her out on it. Charlotte: You are not being your excessively cheery self today. What gives? Fine. Don't tell me. Ella: Pierce yelled at me yesterday. He said that I talked to much. So I'm trying to talk less. Charlotte: If I fell apart every time a man told me he didn't like what I was doing, I'd be in a million pieces right now. But instead, I broke through, rose through the ranks, built my own firm and here I am! In this entry level DA job. Ella: But he's like a hero of mine. Charlotte: You need to get a thicker skin, stand up for yourself because the truth is, nobody's going to do it for you. I am still very interested to see where their friendship goes from here. 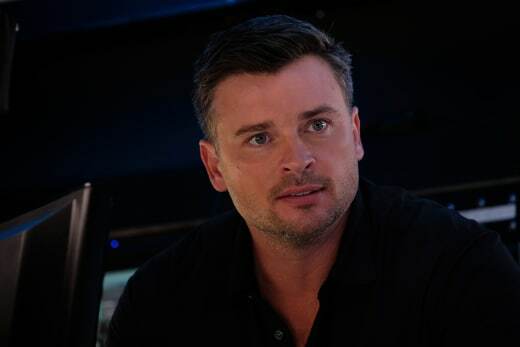 Ella may have misinterpreted Charlotte's advice a little bit, but in the end, she made things right with Pierce in the way that fit Ella best. As for Cain, the reveal of his story was simple but also made a lot of sense. On every show about people who live eternally and have no companionship, the result is hellish. They watch everything they know and love come and go again and again. It was something Lucifer noticed straight away. Neither man has a great love for God and his joking ways, but I still do not believe Lucifer is on the right path. Lucifer's guess, due to the timing especially, is decent. Taking his devil face and giving him wings (Redbull gives you wings!) would seem to our Luci to have nothing to do with him because he thinks his dad hates him. Dad loves the idea of toying with Cain for eternity more than doing something nice for his son. But what else was going on during that time? I've mentioned before Dad could have been rewarding Lucifer for being a good man, finally. Stranger things have happened. It also happened at the exact moment his mother was given her own place. Maybe mom and dad reunited and there was a chat. We don't know. Neither does Lucifer, who refuses to entertain any idea other than Dad hates me, so losing the devil face I hate and having my glorious white wings again is punishment. What an odd fellow. 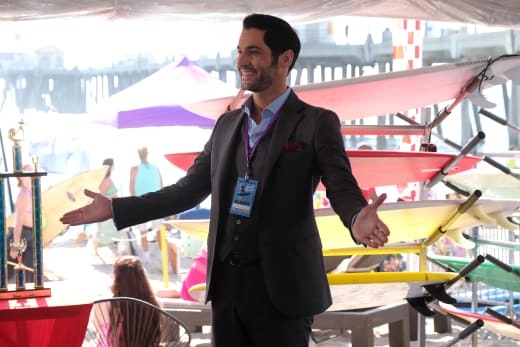 Lucifer Season 3 at Midseason: Best Episode, Expendable Character & More! Using that information, he's going to partner with Cain to try to hurt his dad by killing Cain. If someone wondered why Lucifer felt no wrath for hurting Cain, I think we can rest assured if he succeeds in killing the immortal, Lucifer will come to understand what it means to have the wrath of God fall down upon him. Because up to now, he's felt love and maybe disappointment, but I don't think he's suffered God's wrath, even though, as most children do, he believes it was the cast. 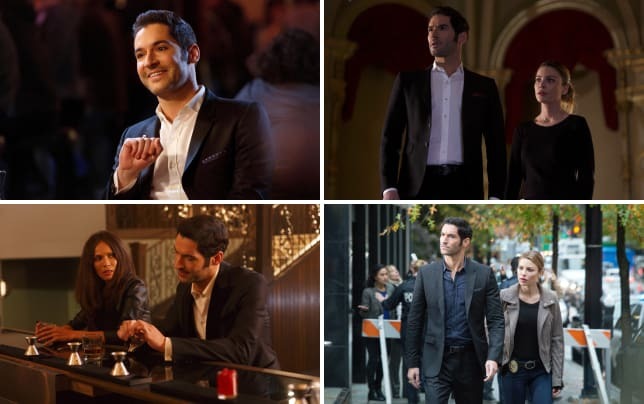 You can watch Lucifer online to come up with your own theories. Be sure to share them below because chatting Lucifer is always a good time. Are you surprised Chloe hasn't questioned who Maze is by now? What are your thoughts on how Maze will bring down the gauntlet on Linda and Amenadiel? Chat about Lucifer's deduction regarding his kidnapping and his cunning plan, too.